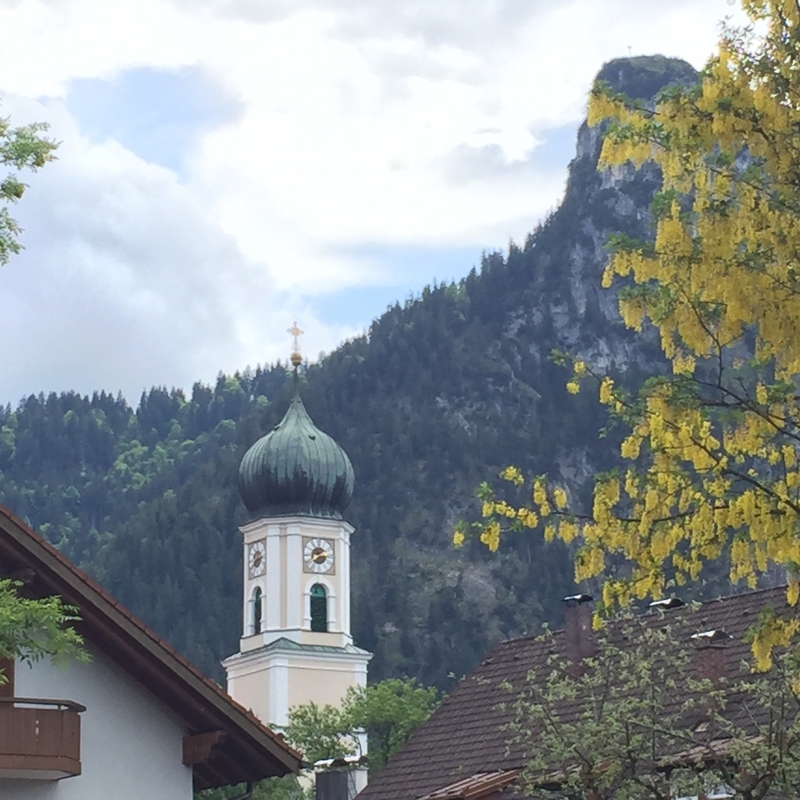 Now that I’ve been home for a bit and have recovered from jet lag, I am feeling reflective about my recent trip to Oberammergau, Germany. I first detailed my journey in this blog post. 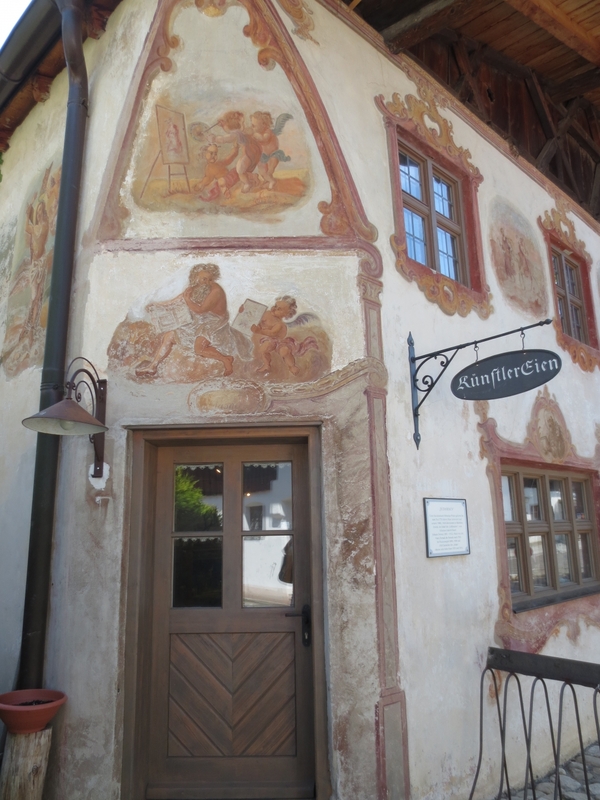 When I read that post I can tell that I am in the moment, blogging from Oberammergau. I miss it already. 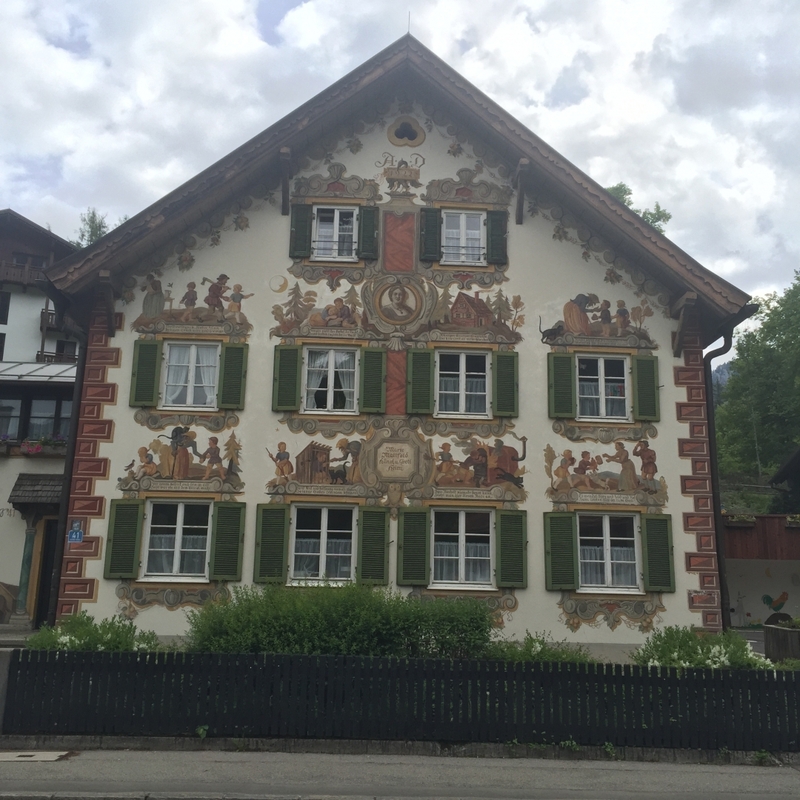 As I reflect on my time in this beautiful Bavarian town, it occurs to me how unique the hand painted houses are. This technique is called Lüftlmalerei. (Luft means ‘air’ in German. It’s believed that the term illustrates how fresco artists must work quickly to apply watercolor paint to the wet plaster before it dries in the open air.) Not only are homes painted this way, businesses are too. 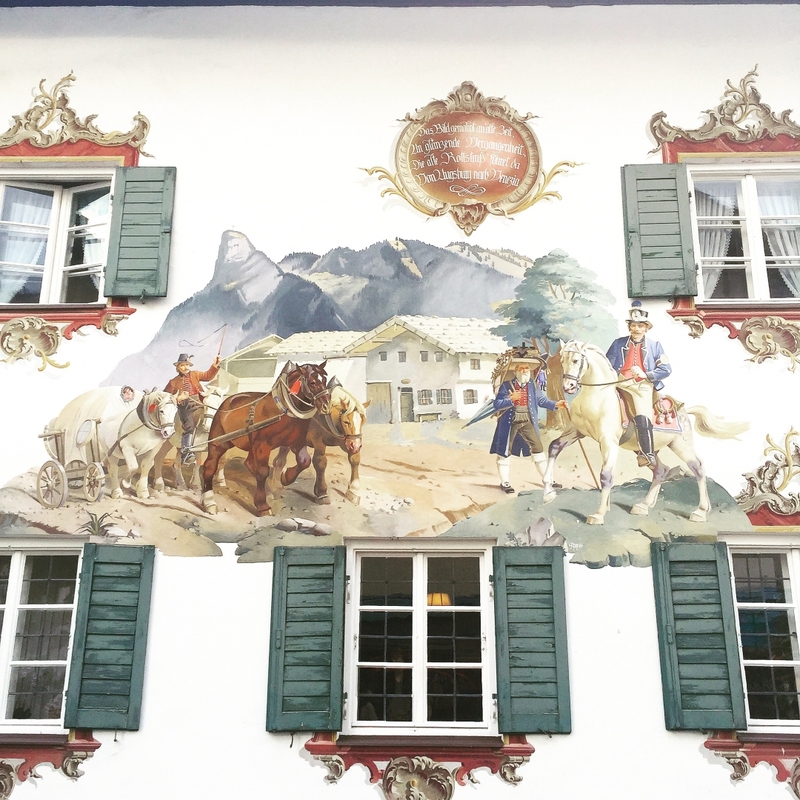 Luftl (Luftmalerei) fresco paintings are the characteristic decorations on houses in Alpine regions. They date back to the 18th century when wealthy merchants, farmers and craftsmen showed their wealth and status with colourful frescoes on the façade of their houses. The paintings often incorporated existing architectural structures, such as windows or doors, or took the form of medallions or scenes from the Bible, fairy tales or folk festivals. The most famous Luftl painter was Franz Seraph Zwink (1748-1792) who lived in Oberammergau for many years. He lived in a house called ‘Zum Luftl’ which could be where the word luftl comes from. Other theories as to the origin of the word include it being connected to the word luftig (fast) or luft (air) – the frescoes being painted in the open air. 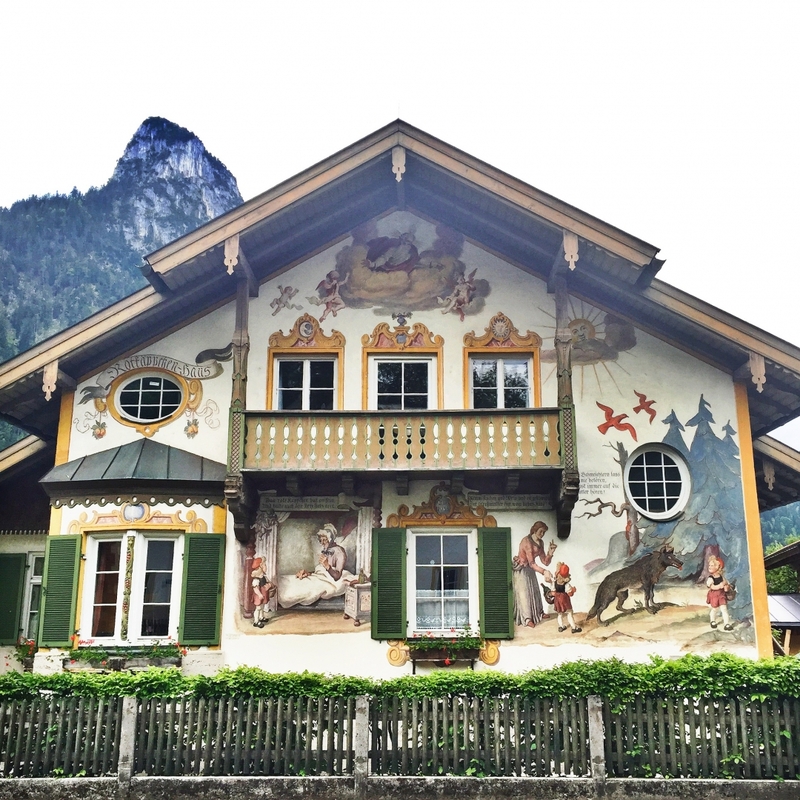 There are two houses that are an absolute must-see when you are in Oberammergau. The Hansel and Gretel House (5th picture) and the Little Red Riding Hood House (1st picture). Both of these houses are part of an orphanage. If you look closely you will see that the entire fairy tale is depicted on the house. 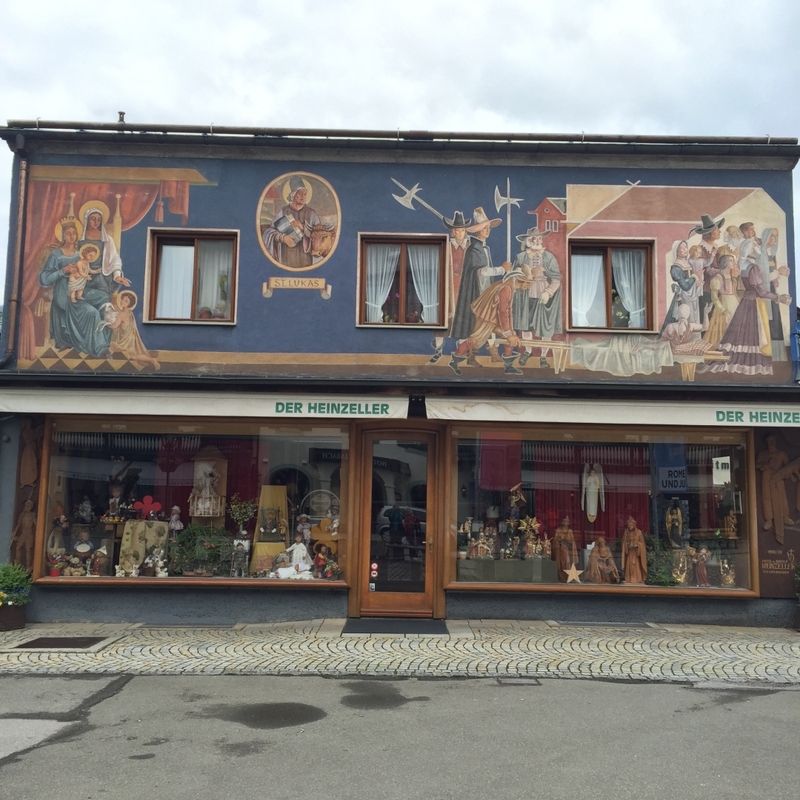 Other houses depict religious scenes and Oberammergau folk festivals. 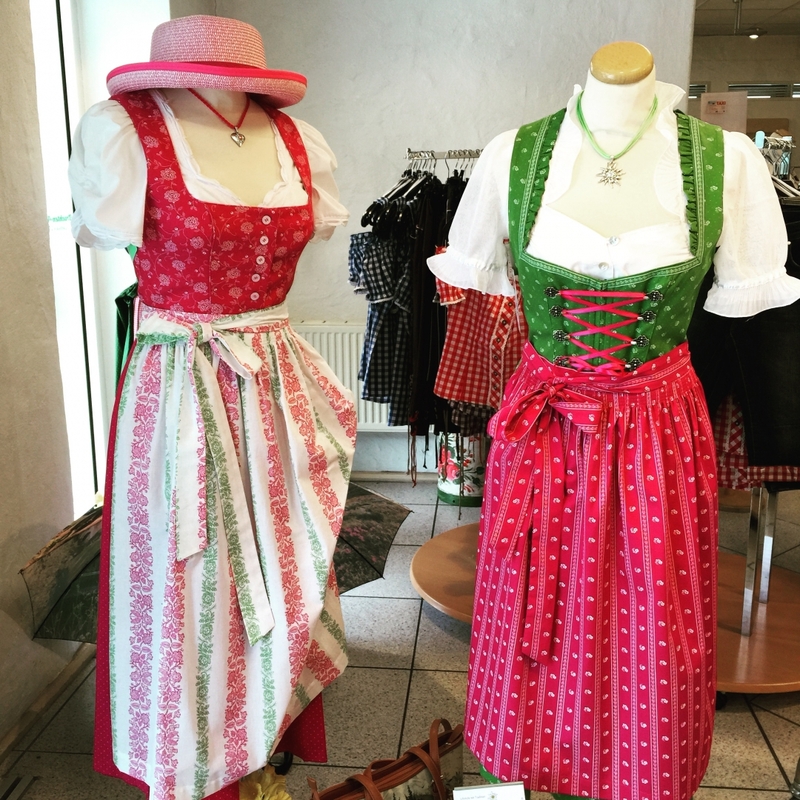 Oh, and why I am at it, I threw in a picture of traditional Bavarian dress – the dirndkleid. The dirndl is the classical dress for women in Bavarian traditional costume fashion. Quite literally, dirndl means young girl, but today it is more associated with the dress than with the woman wearing it. The name has not been chosen by accident, however, because the dirndlkleid, as the dirndl dress is also called in German, makes women of all ages look their very best! I thought about buying one and doing a fashion post. Wouldn’t that have been a hoot. As I said in my first blog post about this journey, I always start my travel plans with TripAdvisor. It’s a great on-line tool to research your destination and check out customer reviews. Even if you don’t book your travel through this site, it’s a great place to start. 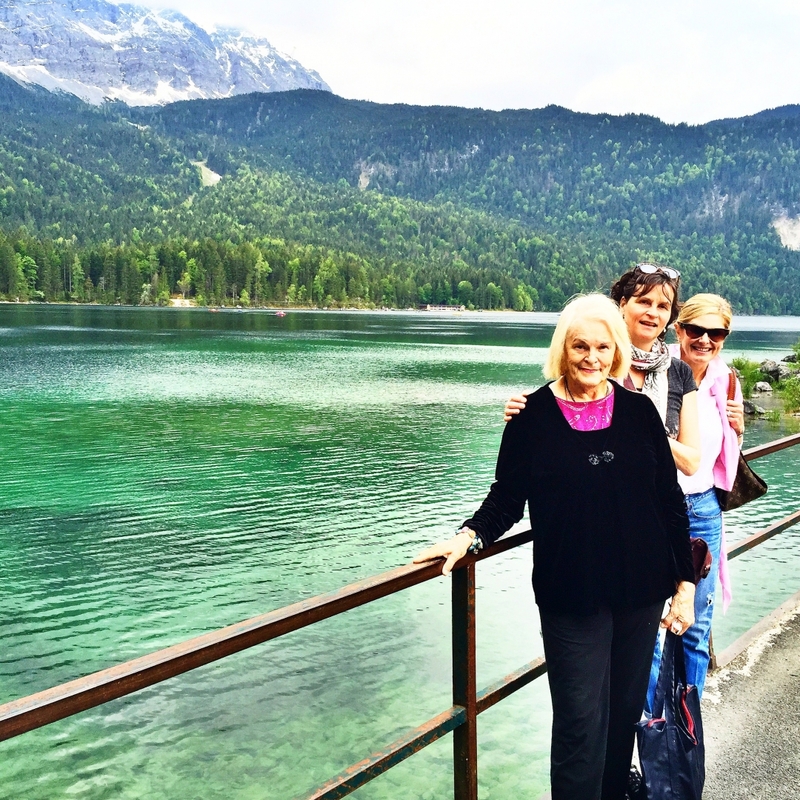 I love this picture of my mom, aunt and me on the Eibsee (near Garmisch-Partenkirchen). In the end, all we have are memories of special times together. I am grateful I got to have this time with my German family and friends. I love the old,decorative homes and businesses! And the traditional German clothing! It’s definitely a place I would consider visiting! I really appreciate the art they have in Germany, great seeing you visiting it! so beautiful! I would love to go to Germany one day ! ! ! Nice photos. I actually think those dresses are so cute. Germany has very beautiful art paintings. I would love to go there one day. Thank you for posting these pictures. So pretty, my best friend just moved to Germany and I can see why she loves it there. Germany is definitely one of the most beautiful place on earth. It’s one of the places I wanted to go. You surely had fun. P.S I love you blog. All your clothes and how you share your experiences. More power and God bless you! I love this house and the traditional clothing. Scenery is just amazing! I wish I could do a road trip through Germany one day! The artistry of the homes, and the clothes, is very unique! Germany has a great sense of style, and craftsmanship!! !